Gravity creates the temperature and pressure to start fusion reactions. The fusion proceeds to heavier and heavier cores ending with iron, which remains in the centre of the star. One moment, all light cores are depleted and the gravity wins over the power of the fusion reactions, now absent. The core of the star collapses into high density object, which may vary depending on the star mass. And the top layers of the star explode. And I just cannot find clear explanation why. According to what I imagine, the top layers of the star should just fall into the collapsing core. Is that because of the 3rd Newtons rule? Or do the stars have some need to end with a cool boom? There are lots of possible ways that stars can end their life, even in the subset of cases where the end is violent. Eloff has given an excellent answer, but I wanted to add a few points. You need the right conditions (mass, angular momentum, metallicity, etc) to produce a proto-neutron-star which is able to resist complete collapse to a black-hole. The bounce from hitting that proto-neutron-star surface, and the heating from neutrinos, is what drives the explosion of material. Radioactivity is eventually the source of the light we see from supernovae. The star burns progressively heavier elements on shorter timescales until producing iron (Fe) on the timescale of seconds. After iron, fusion in the core ceases, and pressure support is lost. Gravity is unhindered, and the star begins dynamical collapse. As the Fe-core contracts, electron-capture begins to convert protons + electrons into neutrons, emitting MeV neutrinos. The Fe-core, now largely composed of neutrons is stabilized to further collapse by neutron degeneracy pressure at nuclear densities. Material further out, which is still collapsing, hits the incredibly hard proto-neutron-star surface - causing a bounce (see video analog): the launch of a powerful shockwave outwards through the star. Because the neutrinos produced from electron-capture are so energetic (as dmckee points out), and because the densities are so high - the neutrinos are able to deposit significant amounts of energy into the outer-material, accelerating it beyond escape velocities. This is the supernova explosion. Due to the hot, dense, nucleon-rich nature of the ejecta, r(apid)-process nucleosynthesis produces radioactive Nickel (Ni) and Cobalt (Co). After roughly 10's of days, the expanding supernova ejecta becomes optically thin - allowing the radiation produced by Ni and Co decay to escape - this causes the optical emission we call a supernovae. All massive stars are not believed to produce supernovae when they explode. In the following figure (which is intended to convey the basic idea - but not necessarily the quantitative aspects), regions titled 'direct black-hole formation' are regions of initial mass where the neutron-degeneracy pressure (stage '4' above) is insufficient to halt collapse. The Fe core is massive enough that it continues collapsing until a black-hole is formed, and most of the material further out is rapidly accreted. The region in this plot between about 8 and 35 solar masses is where the vast majority of observed supernovae are believed to come from. To answer why supernovae explode: Consider the schematic process outlined above. The reason why some deaths-of-massive-stars explode and others don't, is that you need the right conditions (mass, angular momentum, metallicity, etc) to produce a proto-neutron-star which is able to resist complete collapse. The bounce from hitting that proto-neutron-star surface, and the heating from neutrinos is what drives the explosion of material. Radioactivity is eventually the source of the light we see from supernovae. Basically any paper by or with Stan Woosley, e.g. Lecture Notes by Dmitry A. Semenov - "Basics of Star Formation and Stellar Nucleosynthesis"
You're correct that when fusion reactions decrease past a certain point because the fuel is used up, the outward pressure created by the fusion no longer counteracts the gravitational forces and the star collapses (rapidly) in on itself. In stars of the right mass (smaller than about 15 solar masses, but large enough to collapse into a neutron star) the compacting core is heating up to insane temperatures of around 100 billion kelvin. This overwhelms the neutron degeneracy pressure that's preventing the star from collapsing further and a huge burst of neutrinos is released. About 10% of the star's mass/energy is released in around 10 seconds, which is a mind-boggling amount of energy. The suddenly halted core collapse rebounds and produces a shock wave that stalls within milliseconds in the outer core as energy is lost through the dissociation of heavy elements. 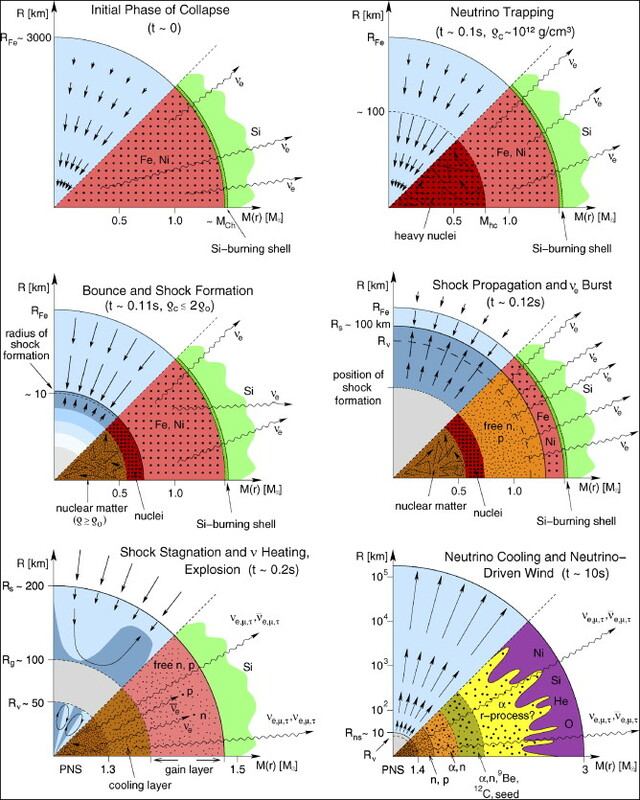 A process that is not clearly understood is necessary to allow the outer layers of the core to reabsorb around 10^44 joules (1 foe) from the neutrino pulse, producing the visible explosion, although there are also other theories on how to power the explosion. So it seems it's this sudden neutrino pulse that's reabsorbed by the outer-core that triggers the explosion. These 2 assumptions can explain why objects in motion stay in motion**, why gravity exists, why the max speed is light-speed, +electromagnetic forces, +the strong/weak force, etc.). At the last stages before the supernova, the matter collapse is no longer in check, and so it begins collapsing to the point where there is no longer space between the matter composing the star. When that happens, matter on the surface has little to no space on the inside and a great concentration of space on the outside. Based on our assumptions, the surface matter will explode outwards at near light-speed due to this imbalance. Space will fill in to the next layer, and this process will continue downwards towards the center of the star, and BOOM...SUPERNOVA!!! **Let's say matter moves at a velocity of ++c(ρf-ρb)/(ρf+ρb), where c is the speed of light (equivalent to how fast space can respond to changes), ρf is the average density of space in front of the mass (in the direction of travel), and ρb is the net density of space behind the mass. As the object moves, space in front responds at light-speed to get out of the way and fill in behind. In this way, the front and rear densities are maintained and constant velocities are maintained. For example, if space is on one side of a mass but none on the other, then the mass would travel at light speed. Because the mass is traveling at light-speed, the space behind it will not be able to catch up to touch the rear of the mass (which would slow it down based on our assumptions), and the space in front will just be able to keep up but not get out of the way, and so the imbalance will remain and the mass will continue on at light-speed (whiche explains why it is so hard to accelerate things as they approach c). +requires positive/negative directional understanding of space which I won't get into right now. ++This is not for sure the equation, but represents an approximation knowing that an object at rest relative to space would have equal densities on both sides and an object with space on only one side would travel at light-speed. The true equation would be based on what would keep the relative densities of space constant for any possible velocity. This "bounce" theory isn't logical. 1. How strong that bounce must be so it can escape such strong gravity and eject very heavy outer layers of the core? 2. For something to bounce it must be elastic in some way or hit elastic surface. What is elastic in this case? 3. Another thing that's bothering me is what happens with bouncing when the core is much denser and shrinks to black hole? Where is bounce in that case? So, I think that supernova is nothing but colossal neutrino explosion with totaly insignificant or in best case very small bounce effect. Not the answer you're looking for? Browse other questions tagged astrophysics stellar-physics supernova stellar-evolution or ask your own question. What is the process that causes a collapsing star to bounce back? Why does a star with its core collapsing and about to undergo a supernova, explode, instead of rapidly collapsing all of its matter into a black hole? How much mass do stars lose when turning into black holes? What determines the outcome of a supernova? What causes a supernova explosion? Why do white dwarfs shine white? If the absolute horizon were exclusionary of matter, what supernova behaviors would that predict? Why does gravitational collapse occur suddenly in a supernova progenitor? What prevents a star from collapsing after stellar death? Why more Fe-56 than Ni-62 as fusion product in heavy stars? Could the singularity of a black hole just be an iron / dark matter sphere?